Not ready to think about autumn yet? You will be once you’ve checked out the new season drops hitting the high street right. now. Allow me to introduce your new capsule wardrobe. These season-straddling staples will propel you through the last weeks of summer and into autumn in style: guaranteed. Not sure how to wear them? We’ve all been there: you pat yourself on the back for snagging the latest must-have, only to get it home and realise you don’t have a clue what to wear with it. But worry no more: each row and column adds up to one complete outfit, giving you at least two ways to style each piece… and ensuring you’ll be ready for whatever the weather may throw at you. What should you be looking out for? Turns out AW15 is all about putting a new spin on this season’s key trends. So yes, your shoulders will still be cold. But snap up a new season cold shoulder knit and at least the rest of you will be warm! Team with a pleated foil midi, denim jacket and boxfresh trainers to bring a touch of bling to your everyday get-up. Fashion’s obsession with the ‘70s shows no sign of abating, so bag yourself a folk-style dress or blouse now and it’ll see you through to next spring. 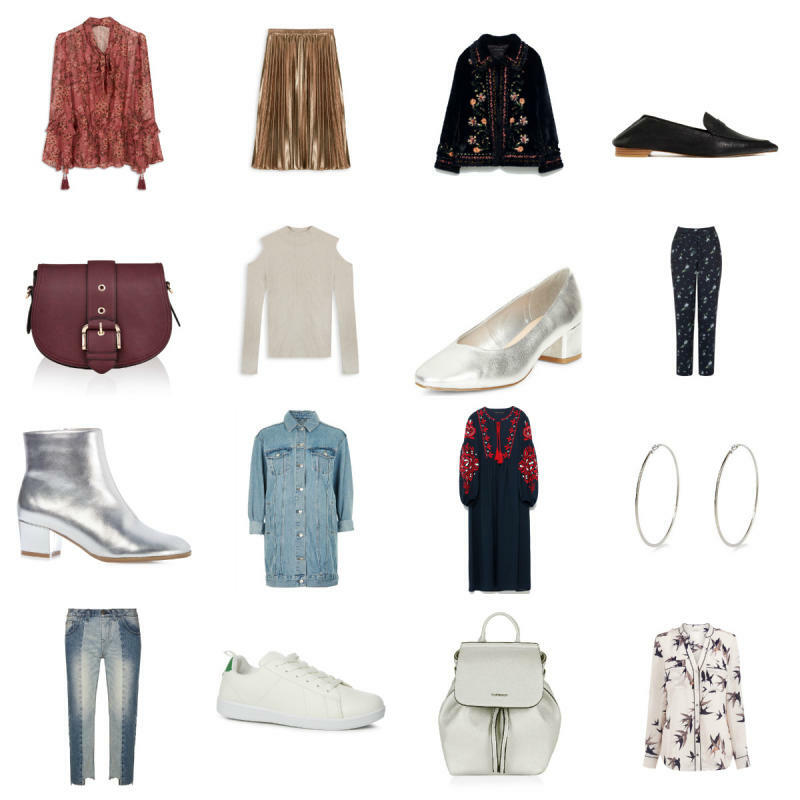 Metallic accents and vintage-style denim will update it for autumn. Need an office-friendly option? Dress it up with a pleated skirt and fancy flats. Still not sure how to do the whole pyjama thing? It’s time to figure it out. Make your prints coordinating, but not matching, for a cooler vibe, channelling your inner Gucci girl with a pair of backless loafers. Boardroom? Slayed. Tease some extra mileage out of your separates by teaming the top with step-hem jeans and kicks, and the bottoms with a silver block heel and cold shoulder knit.